The brand offers five flavors, this Original variety, along with a Habanero, a Jalapeno, a Garlic, and a Peppered. I'll also review the Habanero next week. Apparently a teriyaki variety is in the works, along with a turkey jerky. The first thing I taste from the surface of these pieces is a good dose of seasoning consisting of a moderate saltiness, garlic, perhaps paprika (based on the red color), and a hint of coriander seed (which are visible on these pieces). The chewing flavor starts with a touch more saltiness that seems to increase throughout the chewing, plus a light soy sauce flavor, and what seems to be a light worcestershire sauce too. There's a tanginess in the chewing, and I can also pick up a faint bit of natural meat flavor. The flavor that seems to dominate the overall flavor is the marinade, what tastes like a combination of soy sauce and worcestershire. Not being able to see the ingredients, it's hard to nail it down, but that's what it resembles. It feels rather even between the two sauces, not heavier with one or the other. But the tanginess is also rather prevalent, being quite noticeable in the first half of chewing. Towards the latter half it seems to wear off. It tastes more of a vinegar-like tanginess. The saltiness tends to increase over time. Initially it feels rather light, but as I continued to chew, and moved on to more pieces, it seems to sit somewhere between a medium and high level. The natural meat flavors are very light, perhaps "faint" is a better word. Albeit there's a lot of seasonings on this and a dominant marinade which perhaps makes the meat flavors hard to identify. Towards the last few chews I can pick up a sense of those flavors, but this jerky seems to emphasize the seasonings and marinade. Overall, what you're going to notice in this Original variety is the marinade, having a flavor resembling an even mixture of soy sauce and worcestershire. You'll also notice a tangy chewing, almost vinegar-like. The seasonings are largely a garlic, though that could be in the worcestershire, but also paprika and bursts of coriander seed here and there. The chewing texture starts out with a fair amount of chewing resistance, but still feeling pliable. Once the grains break apart, it seems to get easy from there. By the time it chews down to a soft mass it feels rather steak-like, maybe a touch crumbly. Several of these strips have visible streaks of fat, with one strips having a large chunk. I also found a strip with a sizeable streak of gristle that provided some extra chewiness. I'm also finding some unchewable wads of tissue here and there but overall not bad. 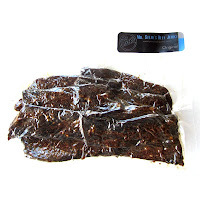 Mr. Steak's Beef Jerky sells this Original variety from its website at a price of $7.00 for a 4oz package. I bought one package along with another package of their Habanero flavor. The shipping came to $3.46, for a total cost of $17.46. That works out to $2.18 per ounce. 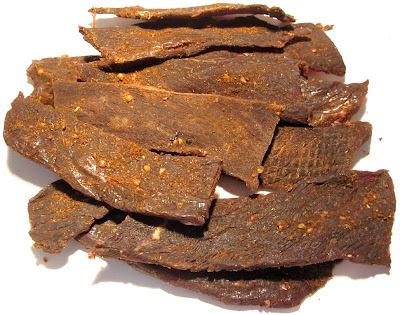 For general jerky snacking purposes, at the $2.18 per ounce price, it seems to provide a decent value. I'm getting a decent amount of snackability for a good overall flavor, good meat consistency and good chewing texture. That price is slightly more than what you'd pay at the grocery store for a major brand of jerky, and yet it seems to provide better snackability. This Original variety from Mr. Steak's Beef Jerky seems to provide an enjoyable overall flavor through a blend of seasonings and marinade. There's a savory flavor coming from a marinade that resembles soy sauce and worcestershire, with a tangy chewing, and what tastes like paprika and garlic. It's actually not an unusual combination of flavorings, other jerky brands have done stuff like this, but I'm simply asking myself if this jerky is "above average", and it seems to be slightly above average. The chewing texture is steak-like and the overall ease of chewing seems easy. But what I think hurts this jerky is the lack of natural meat flavors. I could taste just a faint bit of it towards the latter part of chewing, but it wasn't enough to overcome the stronger seasonings and marinade. 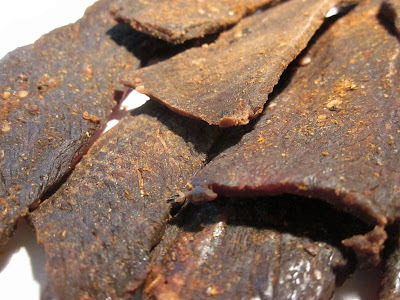 Without the meat flavor, this jerky has to win marks for its seasonings and marinade, and as it is it's not really all that unique. My recommended beer pairing for this, go with a porter. The darker roasted malt should go well with the marinade. Try the Stone Smoked Porter or the Anchor Porter.